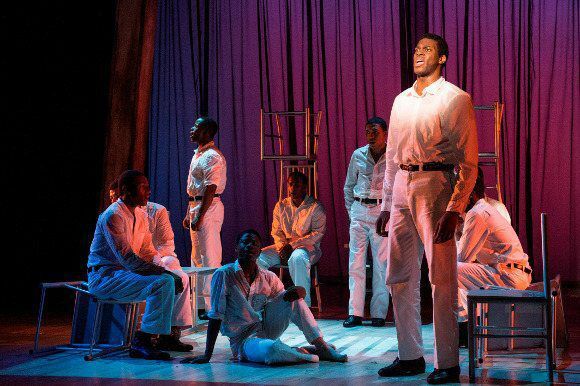 AMDA | AMDA News - Alumnus Kyle Scatliffe wins over the critics in The Scottsboro Boys! Alumnus Kyle Scatliffe is currently starring in the U.K. premiere production of Kander and Ebb's The Scottsboro Boys, directed by Susan Stroman, at The Young Vic Theatre on London's West End. The reviews are coming in strong for Kyle with The London Evening Standard proclaiming "the stand-out performance comes from the imposing Kyle Scatliffe as Haywood Patterson, the most defiant of the accused." The Daily Mail calls Kyle "charismatic" and says "Haywood’s songs Go Back Home and You Can’t Do Me are among the best of the numbers." To read the full text of the reviews, click on the links below.